I am always thrilled to dine at La Pergola in Rome. For there I find one of the world’s greatest chefs, a restaurant manager constantly seeking perfection and a sommelier who presides over a cellar of surpassing magnificence. To sit and eat some of the finest food on the planet, surrounded by silver-gilt side plates originally made for George IV and with wine being poured into the very best Riedel glasses, is one of my deepest joys. I am therefore proud to present to you pictures of the magnificent gentlemen who have made this restaurant a place which everyone who cares about great gastronomic experiences longs to visit and re-visit. Chief among them, of course, is The Master himself – the acclaimed Chef Heinz Beck. Then, seen with your correspondent, are the Restaurant Manager, Simoni Pinoli, and the Sommelier Marco Reitano (who is on the right of the picture). Finally, also with me, is the remarkable Umberto Giraudo, Knight of the Italian Republic, who used to be the Restaurant Manager and is now the hotel’s Guest Relations Manager. At La Pergola only the best will do. ( Needless to say, three Michelin stars twinkle here.) As I went through the calm dining room, I walked past Art Nouveau vases by Gallé and past a table made by Marie Antoinette’s cabinet maker. This is not an establishment which stints on the décor. Then I arrived at my usual table (number 7) by the window. There I found the napkin embroidered with my initials. And before me was the View of views: the whole of the Eternal City set out as a twinkling panorama, with the illuminated dome of St Peter’s Basilica on the right. Soon I was being offered my choice of various exotic salts and numerous mineral waters. A ten course Gourmet Menu is offered at La Pergola for 245€. (When it is the season of the Alba truffle, as it was for my visit, the addition of the divine fungus to a dish incurs an extra charge of 90€.) I ate from the carte. The menu is a wonderful display of the kitchen’s invention and technique. Chef Beck is a man who possesses not only remarkable culinary ability but also a palate of the utmost refinement. His dishes are object lessons in the art of balance – the balance of flavour, the balance of texture and the balance of colour. There is no harshness or aggression in this cuisine. Rather, it aspires to the Sublime. And I am ready to lead three cheers for that. The wine list comes in two large volumes – one for Italian wines, and one for non-Italian wines. I usually count the number of entries in wine lists. Here this was a daunting prospect, but I set off on the Italian book and counted 2,014 offerings. This feat exhausted me, so I will have to content myself with telling you that the non-Italian volume has 76 pages, to its companion’s 83. The total offerings must therefore be around 4,000. As you would expect, these include many great vintages of the best wines. Prices reflect the quality, going from 50€ for an Italian rosé to 27,000€ for the 1888 vintage of Cos d’Estournel. What the latter would be like now I do not know. If I wanted to treat myself to one of the finest clarets, I would probably prefer to go for a bottle from the more recent legendary year of 1961. Indeed, should you want to conduct a vertical tasting of the top clarets from this famous vintage, you will find here Mouton-Rothschild (6,900€), Latour (8,800€), Lafite (9,000€), Haut Brion (7,000€), Cheval Blanc (6,700€) and Pétrus (16,000€). But your pockets do not have to be so deep to drink wonderfully at La Pergola. 1997 was a famously good year for reds in Tuscany, so you could try Ornellaia (750€), Masseto (2,500€), Sassicaia (700€) or Solaia (700€). And those of you obsessed with the greatest red from Burgundy will find 1976 Romanée- Conti (15,000€). I can rely on Marco Reitano completely. He is a sommelier who knows his business. As always, he guided me towards some really excellent drinking. The Dom Pérignon 2006 was how I like my champagne: full-bodied and biscuity. The chardonnay from Sicily was brilliant. This very first vintage of Didacus (2014) produced by Planeta – in very small numbers – was rich, full-bodied, perfectly balanced and joyously yielding of discreet fruit. If you can find this wine, grab it. And the elegant merlot from Tuscany was exquisitely perfumed, despite its ravishing earthiness (Rocca di Frassinello, Baffonero, 2011). 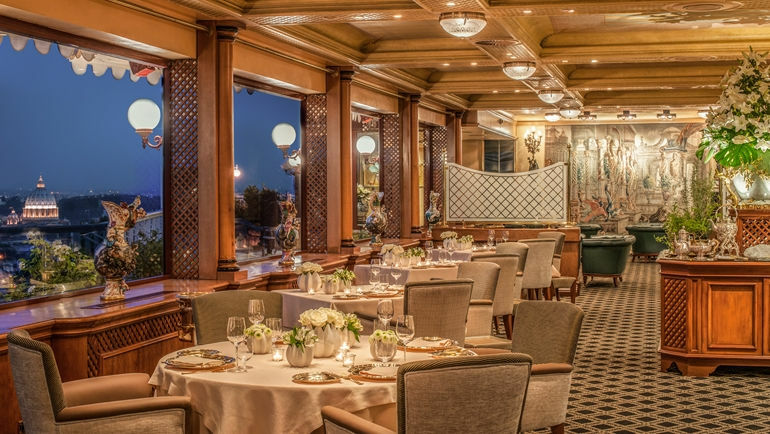 Quite properly, La Pergola occupies a privileged position in the Italian capital - on the top floor of the Rome Cavalieri Waldorf Astoria Hotel. The building is in an affluent suburb of Rome, on top of one of the hills, and it is a highly desirable place in which to lodge. So that is what I did, and it is what you should do. Externally, the building is modern in appearance, although its straight lines are softened by a covering of vines. Inside, the sense is of great space and of good taste – for the hotel is packed with impressive pieces of art. If you like fine oil paintings and antique furniture (and which civilised person does not? ), you will love it here. 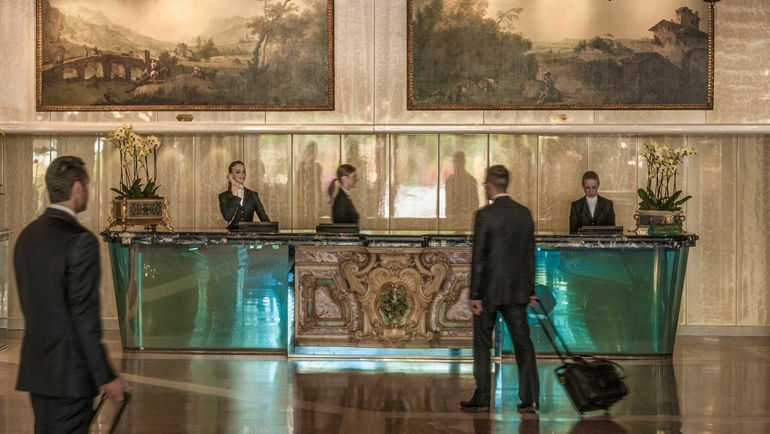 And the level of service – orchestrated by the General Manager, Mr Alessandro Cabella – lives up to the surroundings. My own billet was on the 7th floor. Room 717 was an ‘Imperial Rome View’. (You will need to check on the hotel website for the rates for specific dates, but you should think around 1,200€, plus or minus, a night for two.) This was basically a large rectangle, but its clever decoration – with lemon walls, light wood, marble, blue carpeting, table lamps, numerous spotlights, screens and cornicing – made it seem not only spacious but also visually interesting. Its air conditioning was efficient, there was plenty of comfortable seating, engravings of Classical urns adorned the walls and there were those little items – like a clothes brush and a shoe horn – which indicate that real care has been taken to ensure the occupants’ comfort. For my shirts there was an impressive antique marble-topped chest of drawers. In the bathroom of honey and black marble were toiletries by Salvatore Ferragamo, one wash basin, a bidet, a decent tub and lots more spotlights. A useful feature I have not encountered elsewhere was a very heavy ‘extra door’ near the entrance to the hotel corridor, which could be used to cut out even the slightest penetration of sound from outside. At the other end of the apartment a sliding door of plate glass led to my private balcony, on which cleverly placed mirrors created a feeling of openness. 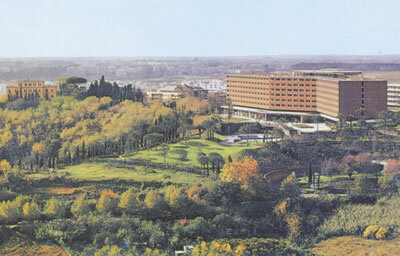 The view was spectacular: over the pine trees to the historic heart of the city of Rome. I spent many happy moments sitting on this balcony, watching the sun sink over the distant rooftops. 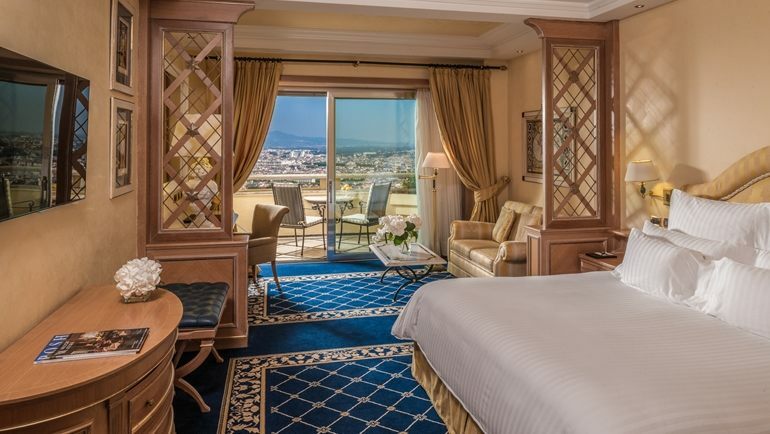 By paying for such an Imperial Room, one has access to the Imperial Club, also on the 7th floor. This is a wonderful facility. It houses Italy’s first ‘broth station’ – the brainchild of Umberto Giraudo. Apart from the comfort and style of the décor and the yellow leather upholstery, this handsome lounge offers such complimentary refreshments throughout the day. I took full advantage of these immaculately prepared offerings, quaffing glasses of chianti in the evenings, Earl Grey tea in the afternoons (with raspberry tartlets and smoked salmon sandwiches) and breakfast in the mornings. For the last I found the comestibles laid out on the buffet – which included bacon, scrambled eggs, prosciutto, melon, bread rolls, marmalade and brioche – of high quality. I therefore began my days in as relaxed and pleasant a manner as I could have wished, sustained by silver pots of coffee, dishes of ice cubes and cups of cappuccino, brought to me by the young lady members of staff. I am always thrilled to dine at La Pergola. 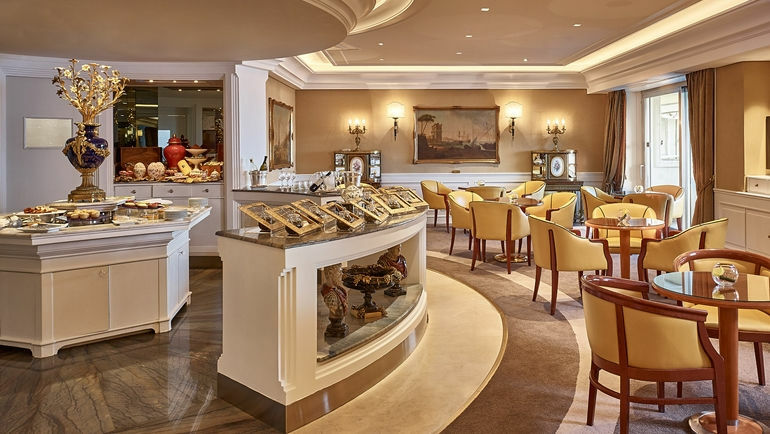 When that dinner is combined with lodging at the Rome Cavalieri Waldorf Astoria, my cup runneth over. I advise everyone to experience such pure, unadulterated pleasure. Via Alberto Cadiolo 101, Rome 00136, Italy.